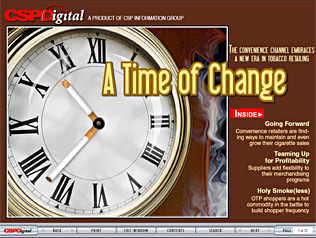 Welcome to CSPDigital's Tobacco edition, a special-edition online magazine focusing on the Tobacco category. Going Forward: A look at how convenience retailers are finding ways to sustain sales in the challenged tobacco category. Teaming Up for Profitability: Increased manufacturer cooperation is a major reason retailers remain bullish on the future of tobacco in the channel. Holy Smoke(less): Product and packaging innovation are driving growth in the Other Tobacco Products (OTP) segment.